As covered in the motorcycle roundabout procedure, these particular traffic systems range vastly in terms of size, traffic density and complexity. As a result, they often put the fear into most learner riders and drivers. Understanding when to go, or move off at a roundabout is a combination of factors involving your control of the vehicle, your observational skills and how you deal with, understand and put into action the information that you observe. Essentially, this applies to both car drivers and motorcycle riders and it’s do to with your control of the vehicle. You should avoid attempting roundabouts until you have a sufficient level of confidence that you can pull away briskly, without stalling and in full control. If this is an issue, then practice moving off quickly on a quiet road until you’re confident in your abilities. Now, this is a bit of a sore point for many rider and driver. You’ll have drivers that simply don’t bother indicating, those that indicate incorrectly resulting in confusion and of course the courteous driver that does indicate correctly. Problem is, you never really know which one is which, so if for example a road user is indicating left – telling you that they are taking the exit before they reach you, then take this information into account, but do not take it as a definite. They may be incorrectly indicating. Learn how vehicles move and react based on their intended route and direction. For example a vehicle taking their exit just before they reach you may begin to slow down and start turning left. On a busy roundabout, if they’re not indicating, then this might be all you have to go on. The moment you see this and you’re confident with your ability to move off safely, take it. On busy roundabouts, we tend to look to our right for a clear time to go. However, as timing is critical, instead of looking at vehicles directly to your right, look instead at what they have to deal with. 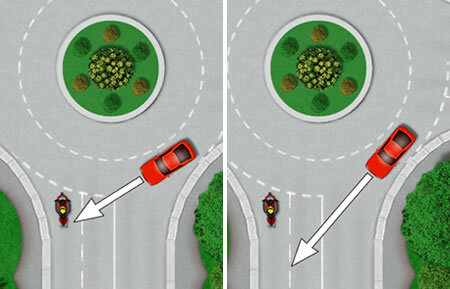 Look for traffic approaching their right, which will in turn make them give way enabling you to predict a gap coming up. There’s no definitive rule for when to go and how to do it, it just takes lots of practice, but putting all these observational tips together will offer you some ‘signals’ and clues on what to look for and in finding an ideal time to go, particularity at a busy roundabout.